Marion has served as the home for many of America’s finest heroes throughout the years. Although he was not a native to Marion, Algie Deforrest Rogers, my great-grandfather, lived almost all of his adult life in Marion, Indiana. Even though some of the facts about Algie’s early life are not known, much about his childhood and teenage years can be documented. Algie lived most of his childhood in Ohio. In Ohio, Algie began his love for baseball. At some point in Algie’s childhood, he must have lived in Marion and then moved back to Elyria, Ohio before the outbreak of World War I.
Woodrow Wilson asked for a declaration of war against Germany on April 6, 1917. With the United States entering the war in Europe, Algie was prepared to serve his country. On October 5, 1917, Algie Deforrest Rogers was inducted into service at Elyria, Ohio. Algie was originally assigned to the 158th Depot brigade, but was transferred to the 308th Field Signal Corp Battalion (Pamphlet). While fighting in Europe during World War I, Algie wrote several letters to his mothers. These letters help to give me an idea about the life of an American soldier. He fought across France and eventually into Germany. Algie fought in the Argonne Forest, one of the worst battles that occurred throughout all of World War I (Tony Rogers). Algie moved to Marion after the end of World War I and his time in Colorado. Upon returning to Marion, Algie decided to try to find a job and settle down. He eventually found a job at the Marion Waterworks. Algie married Florence Dold on December 24, 1929. They later had two children, Deforrest Allen Rogers on April 6, 1931 and then Tony Wade Rogers on January 2, 1933 (Tony Rogers). Algie Rogers lived a very fulfilling life through his happy childhood, service to his country in World War I, and the starting of his own family. Algie Deforrest Rogers grew up like any other child in Midwestern America during the early 1900's. He was born in Elyria, Ohio (Tony Rogers). Before Algie was born, Ila May Boyle married Alonzo Lorenzo Rogers. Ila May and Alonzo Lorenzo Rogers had three children. The oldest child was born on July 7, 1894 and named Algie Deforrest Rogers. The second child was a baby girl, who was born on January 30, 1898. Her name was Tresse Rogers. She later married Fred Vincent and moved to Marion. Tresse ran the Marion children’s home for many years. Fred passed away on April 1, 1917 and she later passed away on April 7, 1998 at 100 years old. They are both buried at Grant Memorial Cemetery in Marion, Indiana (Tony Rogers). The youngest child of Alonzo and Ila was a boy, whom they named Wade. Wade lived almost his entire life in Wellington, Ohio (Tony Rogers). In Ohio, Algie developed a love for baseball that would continue throughout his whole life. He was extremely talented too (Tony Rogers). Algie mentions playing baseball in France during World War I to his mother (1st letter from France). He played on a baseball team in Marion after the war, my research has not shown which team he played for. Unlike many of the age, Algie is believed to have graduated from highschool, whether it be from Elyria, Marion, or elsewhere. At some point in Algie’s childhood he lived in Marion but then moved back to Elyria, Ohio before World War I’s start (Tony Rogers). Algie lived a happy childhood like many other ordinary Midwestern children. My great-grandfather served his country with distinction during World War I. Algie entered service on October 5, 1917 in Elyria, Ohio (Pamphlet). My research has yielded no concrete information on whether Algie volunteered or was drafted into service. Algie was assigned to the 158th Depot Brigade and then transferred to the 308th Field Signal Corp Battalion. The entire 308th Field Signal Corp Battalion was transferred to the 3rd Army Corp. Algie was trained in Chillicothe, Ohio at Camp Sherman (Pamphlet). After his training at Camp Sherman, he was sent across “the old pond” to England. His first letter was sent from Winchester, England. In the letter he talks about being cautioned from writing to much. He says he will have to give up smoking, although he never did, because cigarettes are hard to find (letter from Winchester). Until the war’s end, Algie will only write the country he is in, opposed to the city and country. The next letter was written somewhere in France. This is his first letter since arriving on continental Europe and experiencing warfare. Algie writes all of his letters to his mother, who lived in Marion. In this letter, Algie says his unit has been moving around constantly. He says France is a wonderful country, “lots of pretty scenery and a fine class of people.” Algie tells his mother that he wishes he could speak French. Several French citizens and American soldiers meet and attempt to teach each other French and English. Algie’s mother learns that he is limited on the number of letters he can write. She also learns that her sons has only three Francs, about sixty-five cents, because he has just signed the pay roll (1st letter from France). The second letter from France talks about the lack of mail Algie has received and about his living conditions. Algie is staying in a hotel with part of his company, while others in his company are staying in box cars and others are staying in a palace that was once a king’s palace. He tells his mother that he is ok, but his stomach “has been on the hug” for a couple of days. He says wine is very cheap and the soldiers are only permitted to drink during certain hours. Several soldiers have lost their drinking privileges. Algie describes the differences between French and American cultures for his mother (2nd letter from France). The following letter begins to describe the horrors of war. Algie describes a French city after a battle. There are bullet holes in all of the buildings and artillery shells have hit the ground everywhere. He depicts the image of dead German soldiers lying around with others in shallow graves. It is not uncommon to see a hand or leg sticking out of the ground. Algie says there are some dead American soldiers; however, unlike the Germans, they are buried in deep graves (3rd letter from France). The next letter was written somewhere in France on September 28, 1918. Algie writes about sleeping outside in an orchard, at about 3:30 A.M. American artillery opened fire. He said the whole ground shook. Algie’s battalion has moved forward twice, and plans on moving up again today. Algie tells his mother that he has been operating stations and stringing wire night and day. He also says, “a good barracks would look like a king’s palace to us when we sleep out in the rain. But we don’t even grumble anymore for we have gotten used to the hard knocks and bumps.” (4th letter from France) The next letters in my possession were written after the war’s end. Algie was stationed in Germany for a couple of months following the end of the war. This letter was written on December 16, 1918 in Coblenz, Germany. Algie says he is current doing special work with the 42nd division. He tells his mother about the German scenery, but says he misses America. 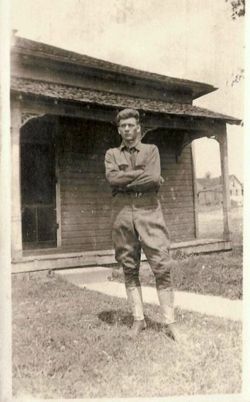 He hopes to return soon because “it is hard to stay over here now since the excitement is all over.” When he learned of the war’s end, he was on the front line with the 5th Division. He said they were unable to celebrate on the front line, but the soldiers in the back did (1st letter from Germany). On December 31, 1918 Algie wrote another letter to his mother from Coblenz, Germany. He talks about receiving a gold stripe for six months service in France. He describes the awful conditions of traveling in box cars (2nd letter from Germany). Next letter written was on July 2, 1919 in Immendorf, Germany. Algie describes the wonderful time he had while in Brussels on a fourteen day pass. Then he talks about finally returning to America and leaving Germany around mid-July (3rd letter from Germany). Although it is never mentioned in his letters, Algie fought through several battles, including the Argonne Forest (Tony Rogers). Algie sailed for home on July 22, 1919 aboard the U.S.S. Pocahontas. He arrived in America on August 1, 1919. The only physical wounds he received were slight burns from Mustard gas. Algie rose from the rank of private all the way up to sergeant (Pamphlet). During World War I, Algie Rogers served his country with distinction. 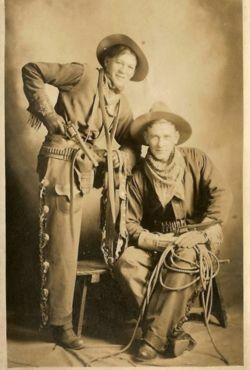 After returning to America, Algie decided to go out West before eventually coming back to Marion. Algie went with his Uncle Warden to Colorado to work for the telephone company stringing wire. After a year or so, Algie decided to come back to Marion (Tony Rogers). Algie originally worked for Indiana Truck, as a tool and dime maker, when he first came home. Then he changed occupations and began working for the Marion Waterworks. He started out as a crew member, then he worked with the boilers and firing them up. Then he was promoted to shift foreman, then to chief engineer. He was eventually promoted to the Marion Waterworks’ superintendent before retiring (Tony Rogers). Algie was also a 32nd degree member, for fifty years, of the Royal Arch Masons of Indiana. He also taught machine shop for several years at a night school in Marion. Algie Rogers married Florence Dold on December 24, 1929. They two sons; the first was Deforrest Allen Rogers, born on April 6, 1931. The second was my grandfather, Tony Wade Rogers, on January 2, 1933 (Tony Rogers). Algie Rogers lived a happy married life and watch his children, and later grandchildren, grow up. Florence passed away on June 4, 1970 at the age of 71. Algie Rogers later passed away on December 28, 1976 at the age of 82. Algie and Florence are buried side by side in Grant Memorial Cemetery (Tony Rogers). Algie lived a very fulfilling adult life in Marion, Indiana. Even though he was born in Elyria, Ohio, Algie lived most of his life in Marion. Algie began his love for baseball as a child in Ohio. He moved from Ohio to Marion, but moved back to Elyria before the start of the war (Tony Rogers). Algie was inducted into service on October 5, 1917. Algie started out at the rank of private, but was eventually promoted all the way to the rank of sergeant (Pamphlet). Algie strung telephone wire in the 308th Field Signal Corp Battalion during the war, but continued doing so after the war in Colorado. After a year in Colorado, he returned to Marion. He eventually found a job with the Marion Waterworks, where he retired from as superintendent. Algie settled down and married Florence Dold and eventually had two children, Deforrest Allen and Tony Wade. Algie passed away on December 28, 1976 (Tony Rogers). Algie Rogers lived a very fulfilling life through his happy childhood in Ohio, service to his country in World War I, and through the starting of his own family. This article is written by Eric Kimmel submitted on June 5, 2007 for Mr. Munn's AP U.S. History class at Marion High School. This page was last modified on 23 June 2007, at 04:13.